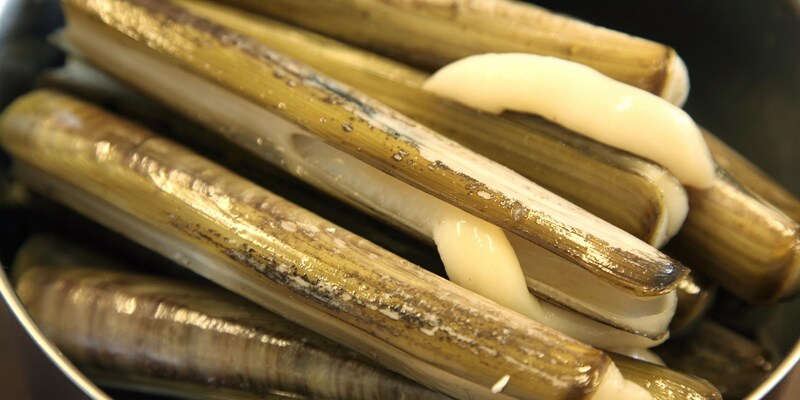 Steaming razor clams is a great method for ensuring a tender, gently-flavoured result. Similar to cooking mussels and other clams, quick cooking is necessary to prevent the razor clam becoming tough and overcooked. The best way to infuse flavour into steamed clams is to add wine, vegetables, and/or aromats to the pan while steaming. Adam Byatt uses a selection of aromatic vegetables like fennel bulb, leek, onion, garlic and white wine in his recipe, whereas Nathan Outlaw chooses carrots, potato, celery and onion with some water. These ingredients should complement, not overwhelm, the flavour of the razor clams. It is best to sweat the vegetables before adding the razor clams, to soften them and bring out the sweetness of the ingredients.